RAMSEY – It has been 12 years since Paramus’ boys soccer team has been this deep in the Bergen County Tournament. Back in 2006, the Spartans played Ramapo to a stalemate for 100 minutes in the championship match and shared the title after a replay was never able to be scheduled (although it might be fun to play it now). There have been some lean years between then and now, including last year’s six-win season, but the Spartans are back with a bang. 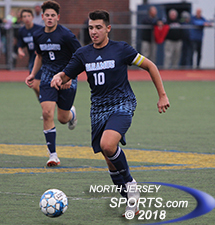 Paramus upped its record to 11-1 for the 2018 campaign and is one of just four teams left in the Bergen County Boys Soccer Tournament after a tidy 3-0 victory over Tenafly in the quarterfinal round on Sunday at Ramsey High School. The Spartans will play fellow gate-crasher Glen Rock in the semifinals on Saturday night at Ramapo High School. The Spartans’ win on Sunday was not a matter of slight-of-hand, but rather a hard-working effort in which they continually probed from the flanks and then rammed the ball into the box where they were willing to fight for it. Junior Tyler Dipopolo was a nightmare on the left wing for the Tenafly defense all day long and it was his bullet into the box from near the touchline that led to the Spartans’ first goal. Senior Justin Behnke created space for himself inside the penalty area and then pounced when the ball came his way. Off a deflection, he scored from close range in the ninth minute to make it 1-0. Sophomore Frank Kim (left) made some quality saves for Tenafly. Tenafly, which upset third-seeded Dwight-Englewood in penalty kicks in the Round of 16, were out of synch early as it was having trouble timing its runs on the outside. When they got their timing right and stayed onside, the Tigers were and had a chance to draw even in the 24th minute when Karmel Segui played an accurate diagonal ball to Eita Nakagawa, who got a step on a defender, but saw his effort sail high of the mark. Two minutes later Paramus doubled its lead. Again it was hard work by Dipopolo that got things started as he battled for and won a ball close to the boundary then drove it toward the endline. Dipopolo drew the defense and dropped a pass to Massimo Gallaroni, who was denied on his first attempt by a sprawling Frank Kim, Tenafly’s sophomore keeper. Gallaroni was undaunted and deposited the rebound into the empty net for 2-0. 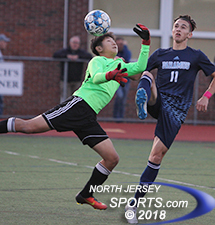 Kim made his best save of the game to keep it right there at halftime when, with a full dive to his right, he denied Paramus’ Ray Shinohara, the senior defender who stepped into open space to have a go from distance. Justin Behnke scored the opening goal for Paramus, which will play Glen Rock in the semifinal round on Saturday. Still within two goals near the midway point of the second half Tenafly had an opportunity when Nick Botis lined up a free kick from 30 yards out that cleared the wall, but Paramus keeper Sebastian Zambrano gloved it down from his chest to keep the shutout in tact before the Spartans added the clincher with 13:15 left in the match. Paramus was pinging the ball around pretty good on a sustained possession inside the offensive third when Gallaroni drove hard in the middle of the field and forced the defense into a clearance mistake. Saleem Shqair was waiting on the back side to hammer the ball home to make it 3-0. Tenafly’s last chance was foiled by the crossbar on a penalty kick in the 70th minute. The shot was right down the middle but it hit the framework and bounced straight back down into the field of play before being cleared out. Paramus has as good a shot as any team left in what has probably been the most unpredictable Bergen County Tournament in the last decade. Paramus and Glen Rock are full of confidence, they are similar sides with thick senior classes and both are two wins from the coveted county title in advance of their matchup on Saturday.